After giving it some thought I responded that I did not view our tour this way. Rather, our riding in Colorado highlighted how we have changed both as riders and as a team. Felkerino and I rode our first tour together in 2005, an eight-day jaunt from Rockville, Maryland, to Niagara Falls. Over the course of our trip, we averaged 97 miles a day. 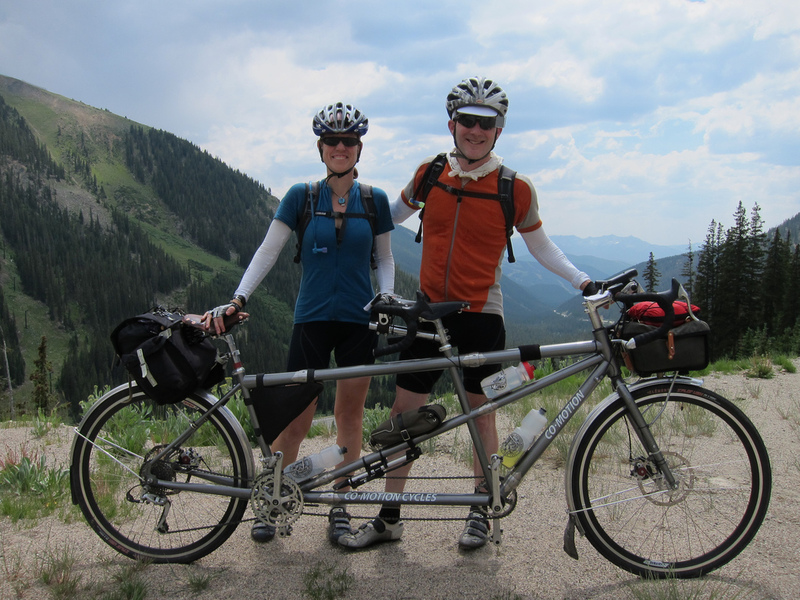 We carried four Ortlieb panniers on our old Cannondale tandem, and we toured on 700×28 mm tires. While perhaps not known for its mountains, that tour took us through the gnarly territory of Pennsylvania, New Jersey, and the Finger Lakes area around New York. chose tires that were what we would now consider way too narrow. Over the years, we have honed our system. For this tour, we completed 597 miles in seven days, an average daily mileage of 85. That seemed to be about perfect. We did not have to get up insanely early, and we could pause to take photos and stop to check out little towns along the way. The changes I saw and felt on this tour were not just about gear choices and daily distances, though. I also observed increases in Felkerino’s and my mental and physical strength over years of riding together. Until this year, a tour like this would have been unfathomable and I cannot imagine loving it the way that I did. 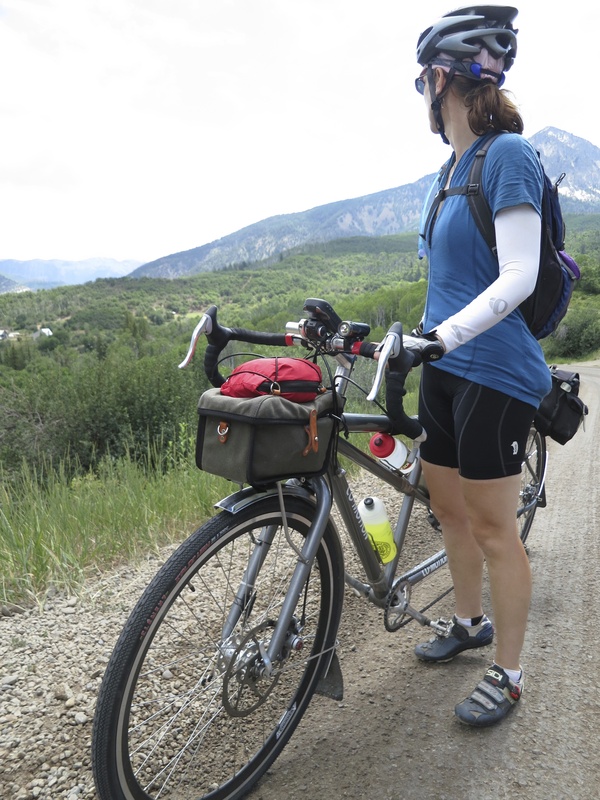 Randonneuring, because of its contrast to pure touring, is excellent bike tour prep. It makes 100 miles seem normal– on the short side, even. The brevets over the past years helped me understand and appreciate what it is to be completely in the here and now, as opposed to feeling the need to keep pushing ahead to the next control or the overnight. I hardly ever feel like I’m exactly in the place I’m supposed to be and yet, I existed in that state for seven straight days. Ironically, we still began our tour with the Trail Ridge 200 RUSA Permanent and not a true tour day. We spent the day on the clock collecting signatures as we went, but it was alright and actually helped instill some good discipline into that as well as future days. 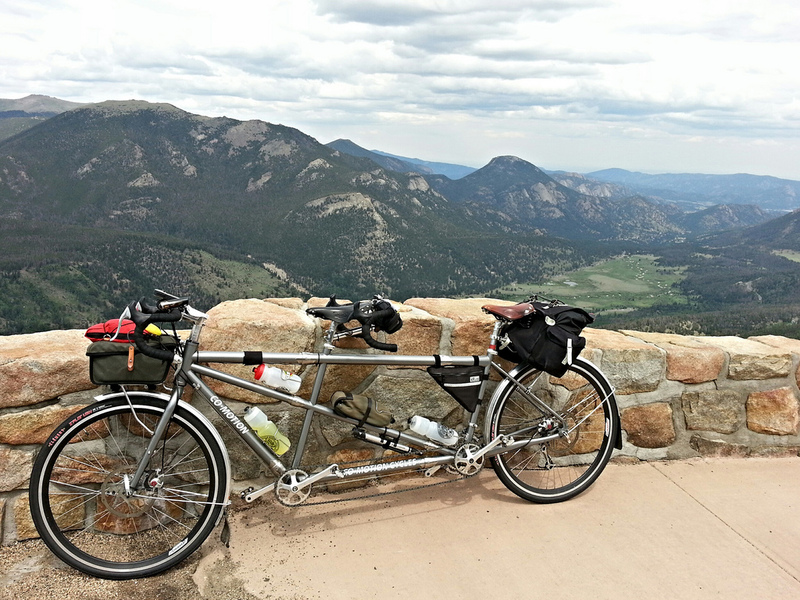 It also made every day that followed a little easier since Trail Ridge Road set the bar for our long steady climbs. It was the most difficult pass of our tour, due to its elevation, the time we spent scooting along the ridge, as well as the traffic we encountered going up. In the past, if we had started out touring with a 134-mile day that included going up Trail Ridge Road, I would have been sluggish for the coming days as a result of the big effort. Instead, my body was well-conditioned and totally up to the task (except for the being afraid of falling over the mountain part). AND I thought if we could get up Trail Ridge Road, we could climb anything. Our route invigorated me, and I awoke each day eager to see where the day’s ride would take us. Every day’s terrain was different. The day between Kremmling and Glenwood Springs was unshaded arid beauty throughout. McClure was a gentle up in between stunning rock formations. Kebler Pass shaded us with its plentiful aspen trees. The gentle switchbacks on the quiet road leading us over Cottonwood Pass took us up to incredible views. Yes, we tired along the way, but never did I wonder how I would make it through the day. Felkerino showed how he has developed with routing, and we also received the expert and generous assistance of Colorado randonneurs John Lee Ellis and Tim Foon Feldman, who helped us create a perfect summer bike tour. We could not have kept going at the pace we were, but for seven days, it was bliss. “Do you think this tour will change you as a rider?” Of course, every tour changes me in some way, but really, this tour showed me how much change we have already been through. Right? They are fantastic, albeit a little noisy for my tastes on some sections of pavement we rode. OK, now that I’ve read the rest of the post – its a great reminder to stop and reflect how we all change as riders. Randonneuring and gravel grinders would never have figured into my vocabulary 12 months ago…yet I’m incredibly grateful to have had the opportunity to do both in such a short time. Congrats on the tremendous achievements in CO – hope to catch up with you soon. I love reading about your and Felkarino’s cycling adventures. Fantastic read of a fantastic journey! Thanks for taking the time to reflect, write and share the pictures! I enjoy every post! You were right here in my neighborhood! Longmont is a town right near Boulder, my roommate works out of Loveland. so /wave!! I’m glad you had a great time! I didn’t quite understand all of your post, but I get the gist of it. I hope one day I can do a bicycle tour. Maybe this year my idea to ride the 200 miles to my dad’s house for Thanksgiving will come true? Ha! Yes, best keep writing :). You live in a beautiful state! Looking forward to going back there again soon. such a lovely post, which i really enjoyed reading! it’s always good, ain’t it, to look back, make changes, then look at the present and the future. So true! I loved reflecting on how all the riding I’d done in previous years had brought me to this tour. Okay, I admit that was a little ridiculous, but at the time it seemed like excellent strategy! Also, Felkerino reminds me that, in fact, we left at 2:30 a.m. so… that is much later than 2 a.m. AND if we had not left then, we might have missed out on all the beautiful stars. !! Great post. I know we talked about your transition, and it sounds like you’re having fun exploring new biking avenues– touring and off-roading. You guys continue to inspire me to learn more about biking! Yeah, it’s been a great year of changing things up. Thanks, Lisa, it’s so nice to hear we inspire! Pingback: 2013 In Progress: Kept the Spreadsheet and Changed My Story | chasing mailboxes d.c. I think you found perfection in your touring setup – light bags and credit cards. That’s inspiring me and hopefully my wife. I’ve been thinking about the Ush tires for road/gravel travel on a Cross Check. Did you get the 120TPI? Oh yes, I wondered if you had toured fully loaded or. I still would like to do a summary gear post of our credit card tour. Basically, take nothing but a multi-tool and a spare tire… okay, maybe slightly more than that! Yup, fully loaded as in read rack with panniers, stuff on top, lowriders in front with panniers. When I was young it wasn’t too much to carry. It’d be a bit harder today. Clements USH; I may go for these for off road riding. 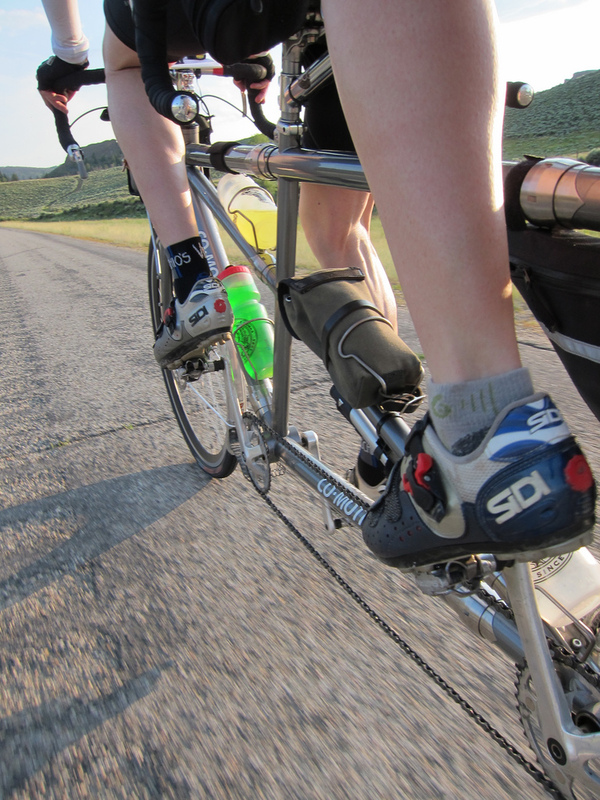 Pingback: 2013 in Review: Goals, Mileage, Rides, and Runs | chasing mailboxes d.c.